Every gentleman looks good in a grey suit and, whilst there are countless iterations of this wardrobe staple available to choose from, there is only one style that is going to give you the most bang for your buck. We’re talking about a slim-notch-lapel, two-button, double-vented suit in a shade of grey (not too dark, not too light) that will seamlessly work with everything else in your wardrobe. 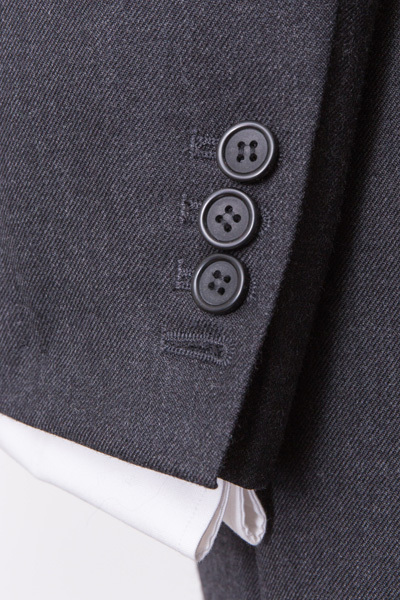 This grey charcoal suit was made and cut in England from a medium weight wool and, as much of it as possible was hand-tailored. This style of suit takes 8-9 weeks to make, unless you opt for our Express Service. A halfway baste fitting and then a forward baste fitting is completed before the suit is finished and delivered. 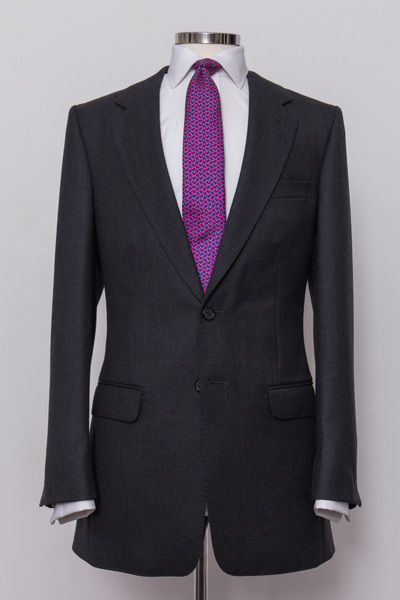 The grey suit cloth is from Holland & Sherry, who own a fabric mill which was founded in London in 1836 by Stephen George Holland and Frederick Sherry and their Head Office still resides on Savile Row today. The jacket has working cuffs and horn buttons. See also: Charcoal Grey Suits, Charcoal Grey Three Piece suit, Dark Grey Suit, Grey Pinstripe Suit, Grey Slim Fit Suit, Grey Two Piece Suit, handmade suits, Mens Bespoke Suits, Mens Grey Suits, Savile Row. TAILOR TALK – A professional tailor might seem to speak a strange language at first – the language bespoke. 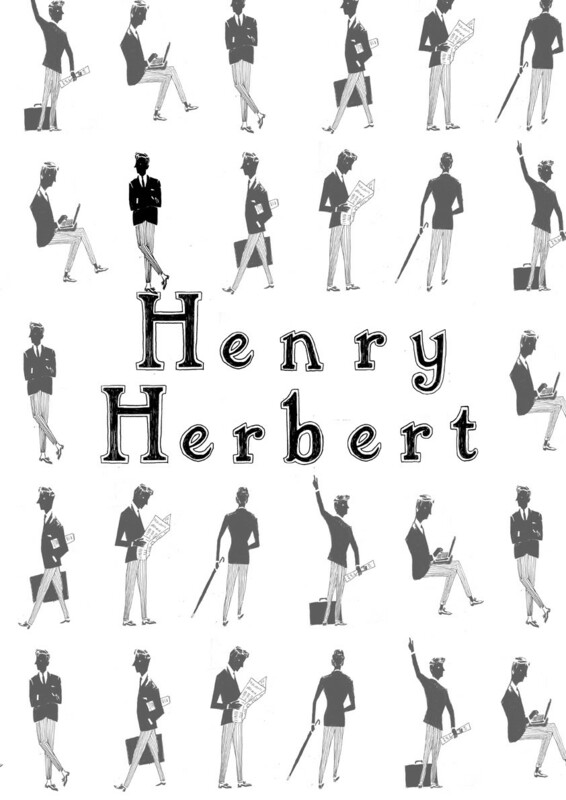 But most importantly he, or she, should make you feel at ease and to ask any question you wish. If you are not sure of something, just ask! 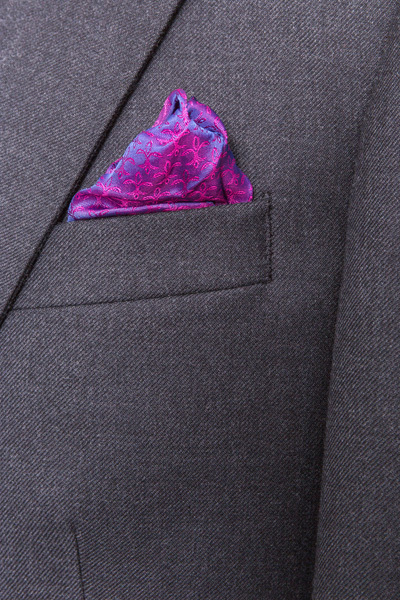 Bespoke simply means made to your individual and specific pattern. The handmade tailored suit is therefore a one-of-a-kind garment that is created to make you look your very best. Understanding how best to convey your needs ensures that the tailor is able to translate your imagination into the perfect bespoke creation. A bespoke suit speaks volumes about the wearer’s personality, character and style. Set your own trend by taking inspiration from style conscious leaders and influencers that you admire. Choose classic Saville Row style for a bespoke suit with timeless appeal or opt for contemporary simplicity with James Bond inspired elegance. Use visual references to ensure your tailor knows exactly what you want to achieve. 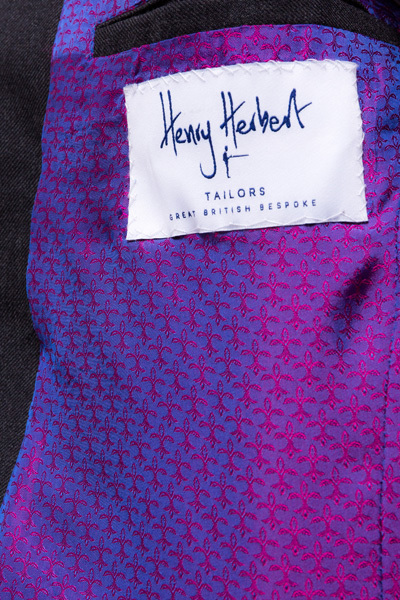 Find a tailor who speaks your language to ensure he makes a bespoke suit that is made from a hand-drawn paper pattern to your exact body measurements. Specialist tailors have mastered specific structuring techniques that create distinctive styles of tailoring. Whether your preference is traditional British or modern continental it is essential that you find a tailor with a complementary house style. You will feel more comfortable and relaxed with a tailor who specialises in your preferred garment style than one who has a long list of celebrity clients but doesn’t make the kind of suit you want to wear. The tape measure never lies! No matter how you think you look the tailor will take multiple accurate measurements to capture your natural shape, size and posture. There is therefore no use in sucking in your belly when the tape measure winds around your waist. Allow the tailor to measure up so that the suit can be adjusted to compensate for specific features that you’re not comfortable with. When visiting a tailor it is important to present the bigger picture. This means openly discussing your specific needs and requirements, along with suit purpose. When you’re being measured up you should therefore attend the appointment in suitable clothing that gives the tailor an opportunity to evaluate your unique shape and size. Wear a favourite suit and dress shoes to demonstrate how you naturally carry the garments. When choosing a bespoke suit it is best to opt for a handmade suit that flatters your shape and size without being overly flamboyant in design. Save the quirky personal touches for the details. Add bold and luxurious silk lining to the jacket, elongate or widen the lapel and finish off with smart symmetrical buttons on the jacket sleeves. For a perfect silhouette choose a double vent. A bespoke suit is made to your unique body shape and should therefore fit you perfectly. This means that you’ll have no need for belt loops on the trousers. Choose adjustable side tabs, with buttons, for added comfort and a streamlined look. Take your time over any decision regarding fabric, colour, fit, style and cost. After all you want to be completely satisfied with your bespoke suit so use the multiple fittings as an opportunity to double check details. By the third fitting your suit should be practically ready to wear. Once your handmade suit is ready to wear your personal specifications will be stored in the tailor’s file, for your next appointment. See also: bespoke suit, bespoke suit fittings, bespoke suit london, handmade suits, Henry Herbert Tailors, Savile Row Suits, tailors in london, what makes a good tailor, what to ask your tailor. handmade suits Archives - Bespoke Suits By Savile Row Tailors.